Have you ever been in such a strange place? No? Then do not let your chance to slip and start this adventures through the portal. You have a weapon that helps you to move through different areas. So, just do everything to reach the goal! You may noticed that this morning you woke up in a very strange location. Your task today is to find your way to the exit door, and go through it, alive. 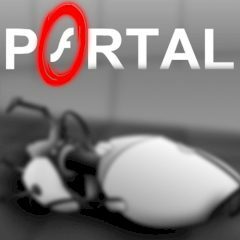 You may not be able to complete the task using your body only, but thanks to the Aperture science hand held portal device the impossible is easy. Try shooting two holes, one reachable through your cell and one out of it. See what happens and use the main weapon. Be sure that this game is specially for you! Just enjoy the game and start your adventure here.